Group Huddle is going to be a good time. Image Courtesy of Parker Menzimer. Wine and poetry make for a pretty cozy evening. Topos bookstore plays host to the first evening in a series of monthly readings tonight with a multidisciplinary crew of writers who present recent work that has been compiled into a zine. "It's about building community in Ridgewood", organizer Parker Menzimer tells Bushwick Daily. 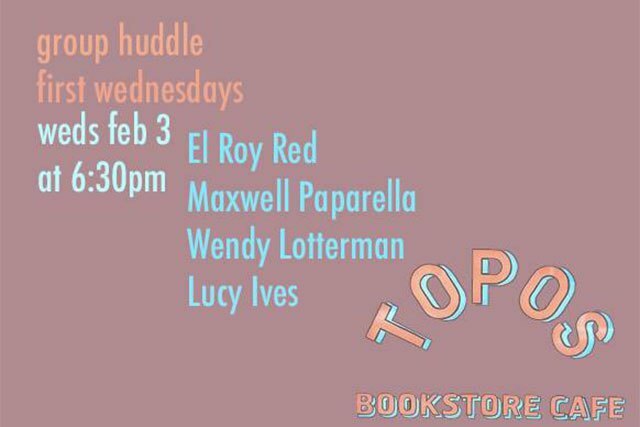 The lineup includes El Roy Red, Maxwell Paparella, Wendy Lotterman and Lucy Ives and, yes, there will be wine (and coffee at the counter, if that's more your thing).